SouthWest Wholesale has been synonymous with reliability and excellent customer service for decades so it’s no surprise that the wholesaler is celebrating an impressive 40 years in business this year. A commitment to providing customers with the best possible service has earned SouthWest a loyal customer base and it is this repeat business that has kept the company going through numerous economic upheavals. “We were actually going through the customer lists last week and noticed that there are five or six that have been with us since the very beginning. I think that loyalty is testament to the hard work that’s gone into making the business a success,” said Jamie O’Sullivan, Director at SouthWest Wholesale. SouthWest Wholesale Ltd began operating on March 1,1979. “My father, Jim O’Sullivan and his original business partner, Brendan King, both worked with Kellihers Electrical. They decided to leave at the same time and start their own business, SouthWest Wholesale, which they grew slowly over the years. “They originally had a very small trade area and for the first nine months, all of the goods were stored in my parent’s house. They moved into the new premises, which we’re still in now, on the 1st of January 1980,” said Jamie. Jim is the Managing Director at the company and has been at the helm for 40 years. With 58 years in the electrical industry under his belt, it’s no wonder the company has become the success story it is today. Jim’s sons, Jamie and Mike are now also part of the business. Jamie is the General Manager and Mike the Purchasing Manager. Mike also looks after the company’s involvement with the Irish Electrical Buying Group (IEBG). 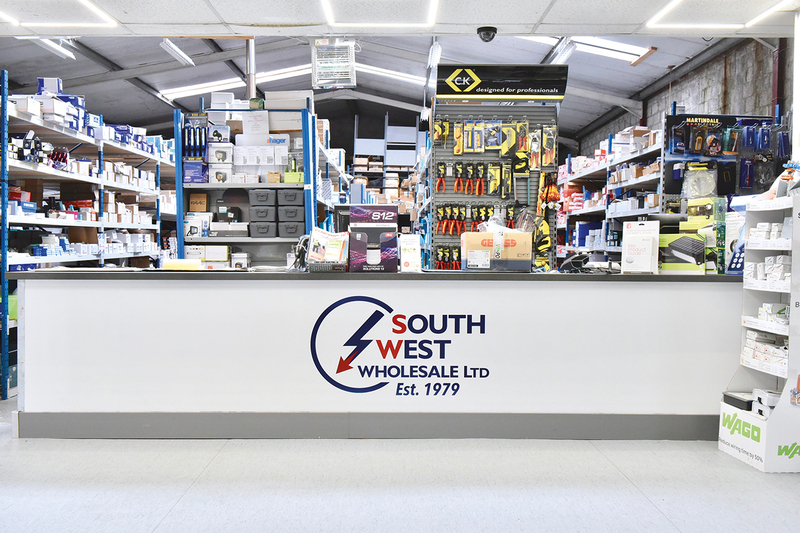 SouthWest Wholesale is by no means the only electrical wholesaler in Kerry but it’s the only independent one that has been operating for so many years. The company prides itself on its well-stocked trade counter and on being able to supply customers with the items they need. All staff members are well versed on the products available at the branch and are on hand to help customers choose the right products for the job. Being part of the Irish Electrical Buying Group (IEBG) for the past four years has also boosted the company’s product ranges. There’s no doubt that the advantages of being part of a group with such significant buying power are being felt. As prices have come down, the competitiveness of the branch has increased while a larger network of suppliers means a larger product offering to customers. Virtually every supplier trades with the IEBG, which allows the 17 members of the Group to offer a wide range of quality brands off the shelf to customers at competitive prices. Each IEBG branch offers its customers a personalised service that is second to none and that’s certainly the case at SouthWest Wholesale. IEBG membership has allowed the branch to significantly expand its product offering but even before becoming part of the Group, SouthWest Wholesale prided itself on stocking products that other firms would not. Being part of the IEBG allows the company to offer its customers a wider and more varied product range and alongside that membership, it’s the branch’s longstanding staff that make the service such a unique one. It is this commitment to ensuring customer gets the best service along with the right product for the job that puts SouthWest Wholesale head and shoulders above its competitors.